Supporters of the African National Congress President Cyril Ramaphosa hold placards and chant slogans during a demonstration against South African President Jacob Zuma outside ANC party headquarters in Johannesburg, South Africa, Feb. 5, 2018. South Africa’s increasingly unpopular President Jacob Zuma, facing mounting pressure from his own party to resign, was on Tuesday stripped of what many saw as his swan song to the people of South Africa. Parliament postponed the annual State of the Nation address Tuesday afternoon, just 48 hours before Zuma was scheduled to appear at the National Assembly in Cape Town on Thursday evening to address the nation. 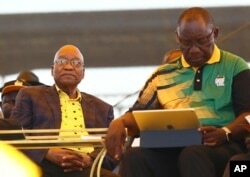 In the last 48 hours, top members of Zuma’s African National Congress have met privately with the president to intensify pressure on him to resign, although he has resisted such calls in an attempt to serve the remainder of his presidential term, which ends in 2019. Zuma’s 10-year tenure has been marked by long-standing, mounting corruption scandals — he faces the prospect of prosecution for 783 counts of corruption, after the nation’s prosecuting authority currently deliberates whether to reinstate the dismissed charges. In December, the ANC named Deputy President Cyril Ramaphosa Zuma's successor as party leader, signaling the beginning of the coda of his presidency. Ramaphosa will be the ANC’s presumptive presidential candidate when the nation votes next year. 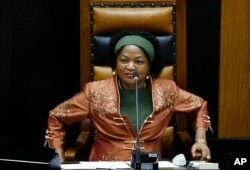 Speaker of the House Baleka Mbete told journalists on the steps of parliament that they were concerned about threats from opposition parties to disrupt the proceedings. 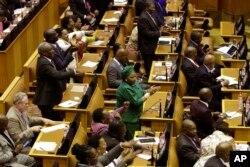 Previous seatings have been disrupted by calls from the opposition for Zuma to resign or be impeached, and disputes involving Zuma have even escalated into parliamentary fistfights in recent years. Zuma has survived nine votes of no-confidence, but his party has increasingly split over his unpopularity, and another no-confidence motion is scheduled for Feb. 22. FILE - Members of the ruling African National Congress applaud as the results are read of a no-confidence vote by MP's in parliament in Cape Town South Africa, Aug. 8, 2017. FILE - Speaker of the South African Parliament Baleka Mbete smiles during an answering of questions session by South African president Jacob Zuma, in Parliament, Cape Town, South Africa, March 11, 2015. Mbete did not say when the speech might be held or who may deliver it. She emphasized that the national budget speech would be delivered Feb. 21, on schedule. Mbete said that Zuma had already separately planned to write to parliament to request a postponement. In separate statements, both the presidency and the ANC welcomed the delay. Opposition Chief Whip John Steenhuisen, of the Democratic Alliance party, told VOA outside parliament that this postponement signals the end game for Zuma’s presidency — a phase he says the opposition welcomes. Political analyst Ebrahim Fakir was hesitant to join the chorus welcoming the postponement. Zuma now faces the toughest test yet, when he is scheduled Wednesday to face the party’s National Executive Committee, which has the authority to recall the president, but cannot actually force him to resign. Local media have reported that Zuma has told his party’s top six leaders that if the NEC demands his resignation, he will comply. Several ministers who belong to the 80-member decision-making body declined to comment on Tuesday. Health Minister Aaron Motsoaledi said the ruling party will settle its disputes behind closed doors.